Saturday night, my friend Iain is visiting for the weekend, I’m running the Bristol 10k in the morning and the housemate wants to go out for a drink. Well, we all want to go out for a drink, but they want some of the alcoholic variety and I also want some pasta for dinner. The time has just gone past 9pm and while the Bristol city centre may have a lot of pubs and bars, I don’t know which ones will still serve food. We figure we’ll head to the Hope and Anchor on Jacob’s Wells Rd and if they are not still serving then I will go back home for dinner. Luckily, and impressively, they serve food until 10pm and they have pasta in the form of a mixed tagliateli with a mushroom and white wine sauce. Jacob’s Wells Rd has in the past few months become one of my favourite locations in Bristol. The buildings are so varied that I pass Nordic styled square apartments, the QEH theatre, a block of council flats, a majestic Hogwarts-like school and some assorted terraced houses just on the way from Hotwells to the Clifton Triangle. There is also the benefit of the lovely local pub ‘the Hope and Anchor’. I’m not sure if it’s a consistent selling point but Iain once had the pleasure of Justin Lee Collins’ company during a Christmas dinner there. We’ve not seen him on any of our later visits but we didn’t need celebrities for a nice time that evening. In the end, we all ordered food and in addition to my pasta, the guys had a lamb curry and falafels in pita bread respectively. I had lime and soda, the housemate was tempted to select a beer, apparently similar to the Bristol Beer Factory ‘Red’, which was kept downstairs, and Iain chose the Butcombe Gold. The pub is hidden away from prying eyes by curtains across the windows and at night it was cosy and warm. The music induced a little head tilting at the chamber music / 1920s sound but no one else seemed to notice. 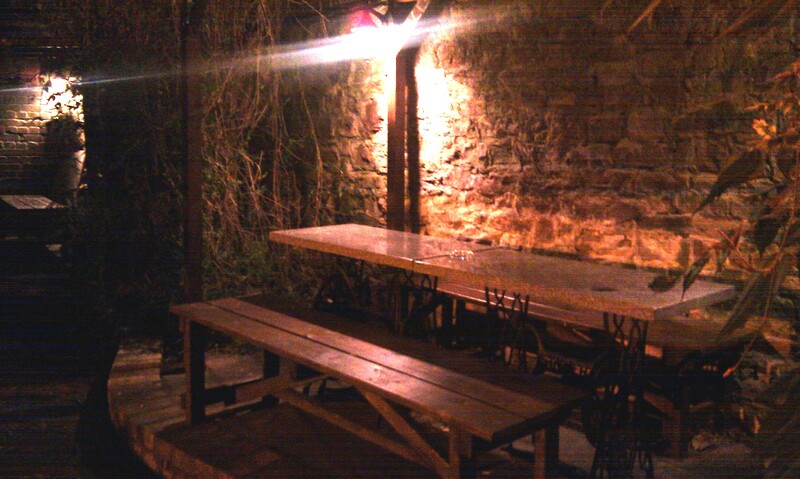 The beer garden outside was on two or three levels and quite spacious. On a nicer night we would have sat outside but it wasn’t that warm. 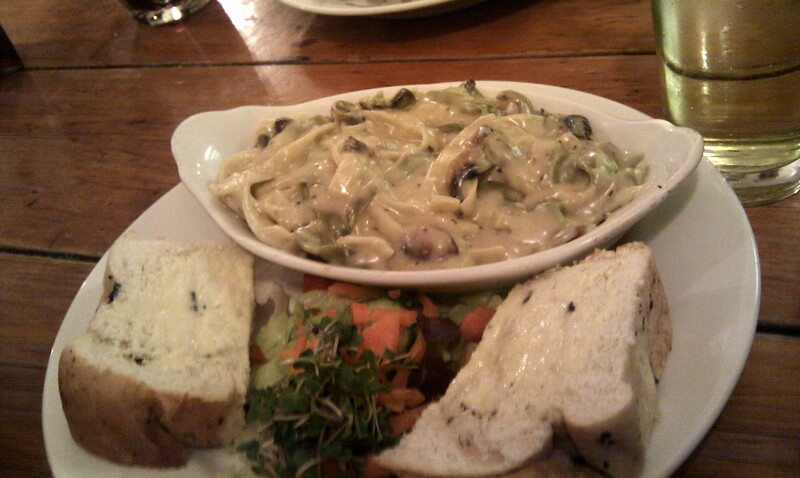 The food arrived within about 20 minutes and my pasta was very tasty although quite definitely pub fare, in a good way. The white wine and mushroom sauce was closer to a bechamel texture rather than creamy but it didn’t need cheese. It was accompanied by large pieces of buttered olive bread. I managed to taste a little bit of the bread but the others finished it off for me. That was a portion of carbs too far perhaps. The lamb curry, which was served with naan bread and chutney, was declared ‘great’ or ‘very good’ (I can’t remember precisely) by both the guys and the falafel was ‘crunchy on the outside and soft inside’. I didn’t try them so I can’t say but a general atmosphere of contentment pervaded the table. By the time last orders was called at just before 11pm we felt that it would have been nice to stay a little longer. The three drinks and three dishes came to £30 and the menu had quite a few other choices. I recommend the burger and chicken pie as well. The Hope and Anchor is the loveliest local I’ve had so far and it’s well worth the trek up from Hotwells or the slightly easier stroll down from the Triangle. You may be lucky enough to catch sight of a celebrity although it hasn’t happened to me yet. This entry was posted in Bristol, Food and tagged Bristol, Food, Hope and Anchor, Jacob's Wells Rd, Pub. Bookmark the permalink.